Weaker than expected UK inflation data (Mar CPI 1.9% y/y vs 2.0% f/c) push sterling further down on Wednesday, as lower inflation reinforces idea that BoE is unlikely to increase interest rates in the near future. Extension of strong fall previous day (0.39%) reinforces negative signal from Tuesday's bearish outside day. Near-term focus shifts lower, exposing psychological 1.30 support, which should keep dips contained and guard key support at 1.2971 (200SMA). Daily momentum remains firm and attempts to break into positive territory that supports scenario of limited dips, but conflicts with bearishly aligned stochastic and 10,20,30SMA's. 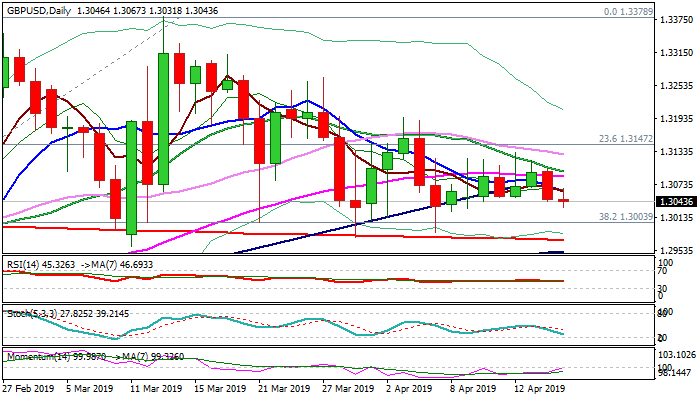 Hopes for fresh upside attempts would remain alive while 1.3000/1.2971 pivots hold, however, lift above a cluster of daily MA's/daily cloud top/Fibo 38.2% of 1.3381/1.2977 (between 1.3060 and 1.3131) is needed to confirm bullish scenario. Lower volumes on pre-holiday thinned market may keep the pair within existing range with absence of Brexit news adding to scenario.